On July 18, 2000, the Supreme Court of Japan dismissed the final appeal of the defendant, the Minister of Health and Welfare, on the Nagasaki A-bomb Matsuya Lawsuit. The court reconfirmed the Nagasaki District Court and the Fukuoka High Court rulings that Hideko Matsuya's disability was caused by radiation from the atomic bomb and ordered the Ministry to withdraw its rejection of Matsuya's application for official recognition of her disabilities as A-bomb induced. Matsuya's victory was made possible by the nationwide support she has received. As the first ruling of the Supreme Court, this judgment holds great international significance. It gives strong impact supporting the claims of not only A-bomb victims, but also nuclear victims all over the world on their deaths and suffering caused by nuclear tests, weapons development/production and accidents at nuclear-related facilities. With this decision addressing properly the reality of long-distance A-bomb victims and pointing out the unreasonableness of the process by which official recognition was granted, the very ground for governments' denial to providing compensation to these nuclear victims has now been lost. This edition of "No More Hiroshimas" carries a summary of the case, laying out points of argument of Matsuya's counsel and the testimonies which substantiate them, as well as statements made by Hideko Matsuya herself and the plaintiff counsel at the 2000 World Conference against Atomic and Hydrogen Bombs in Nagasaki. We express our heartfelt gratitude to the people of the entire world who have given support to this Hibakusha lawsuit, and hope that the information in this special issue will be of use and help to support the struggles of the world nuclear victims. The Ministry of Health and Welfare rejected Ms. Hideko Matsuya's application for official recognition of her disabilities based on Article 8 of the Law on Medical Measures for the Victims of the Atomic Bomb (the A-bomb Medical Law). This Nagasaki A-bomb Matsuya Lawsuit was a case which sought to have this rejection dismissed. In short, in order for Matsuya to receive `medical care (Article 7)' based on the A-bomb Medical Law, it was necessary that the Ministry `recognize' that her disabilities were `caused by the effect of the atomic bomb' or `recognize' that she was `currently in need of medical care because her healing ability had been affected by radiation from the bomb (Article 7 and 8)'. However, the Ministry rejected Matsuya's request on the ground that `the possibility that applicant's disabilities were caused by A-bomb radiation can be denied'. Matsuya decided to file a suit against the Ministry based on the argument that the Ministry's interpretation and application of Articles 7 and 8 of the A-bomb Medical Law were erroneous, and that therefore the rejection must be dismissed. In its counterargument, the Ministry reiterated the reasoning it made when it rejected Matsuya's application in the first place, namely that Matsuya's disabilities could not be understood as having been caused by A-bomb radiation, and that consequently its decision to reject the application was lawful. Therefore, the immediate focus of the case was on whether or not Matsuya's disabilities satisfied the above requirements. So it was necessary for the plaintiff counsel a) to identify the meaning of the requirements and medically explain the disabilities' relation to A-bomb radiation and b) to clarify the burden of proof. The latter refers to whether it was Matsuya who should explain how her disability was related to radiation or whether it was the Ministry who should demonstrate that the disorder was not related to radiation. Additional to these 2 points, the counsel elaborated on c) the reality of the A-bomb destruction and d) the government's responsibility for state compensation for the Hibakusha, because clear understanding of these two arguments were essential in the consideration of the burden of proof. Dr. Shuntaro Hida (was an army surgeon and in Hiroshima at the time of the bombing. Since the very day of the bombing he has engaged himself in providing medical care for the Hibakusha and for the abolition of nuclear weapons) and Dr. Kanehiko Yamashita (who has been in charge of Ms. Matsuya since 1985) testified before the court to medically demonstrate how Matsuya's disorder is related to radiation. Hida's testimony can be summarized into 4 points. 1) The effect of radiation, as generally understood, does not necessarily diminish according to the distance from the hypocenter, and even at the same distance from the hypocenter, there were people who were severely affected by radiation and people who were not. 2) He witnessed boys who were at 2.5 km and a farmer who was at 4.0 km from the hypocenter die after showing radiation injuries. 3) There is an increasing understanding in radiological studies of the serious effect of low dose irradiation on the human body. And 4) medical science is still in its infancy in fully grasping the effect of radiation on the human body, so there are plenty of areas in this field which need to be explored. Yamashita testified with concrete evidence that the relation between Matsuya's brain injury and radiation could not be denied. By showing X-ray photographs of Matsuya's CT scanned brain, Yamashita explained to the judges the large extent of the damage on her brain cells, which, he asserted, was unlikely to have been caused by mere external injury, but rather by multiple effects of radiation. Given that his patient had contracted a polyp in her stomach as well as hysteromyoma, he concluded that the possibility that Matsuya's entire body had been affected by radiation could not be ruled out. In concluding his remarks, Yamashita expressed his indignation at the Ministry's inflexible attitude in rejecting Matsuya's application without showing any scientific facts. When combined with the testimony of Professor Ikuro Anzai, the above evidence showed that the defendant's argument that `there cannot be any effect of radiation because Matsuya was 2.45 kilometers from the hypocenter' was without rational basis. Prof. Anzai (Ritsumeikan University, specialized in radiation protection) explained in his testimony that the DS 86 (Dosimetry System of 1986) was not based on estimation of all kinds of radiation emitted from the atomic bombs, and that there was no way to carry out such a thorough estimation since data on which the bombs' structures and calculations were based is still a military secret. 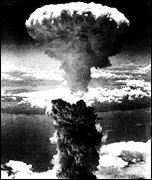 The most important point of Anzai's testimony was that up to now, only ionizing radiation of the A-bombs, such as gamma and neutron rays, had been considered as having caused damage to the human body, but factors such as nuclear electromagnetic pulse and huge amounts of radio waves radiated from the fire ball also must be taken into consideration in estimating the real effect of the bombs. In short, the argument of the Health and Welfare Ministry had been that `the amount of radiation Matsuya absorbed at 2.45 km from the epicenter was a mere 6.1 rad, and it is unthinkable that this amount could have any effect on the human body'. Such a conclusion, however, goes against our common knowledge on the real effect of the bombs. A number of Hibakusha, who ought to have been exposed to a small amount of radiation according to the current dose estimate (DS 86), showed symptoms of radiation injuries, such as loss of hair. Scientifically speaking, these could not have happened. Then what is wrong with the Ministry's argument? It's wrong because it stands on the ground that the radiation dose computed by the DS 86 is capable of explaining every kind of effect of the bombs. Anzai's statement had great significance in the understanding of relief measures for the Hibakusha. He argued that such measures should be based on the reality of the Hibakusha's sufferings themselves and not on contemporary scientific knowledge, whose application would lead to certain A-bomb damages that fall outside its understanding being neglected. He stressed that such a practice should absolutely be avoided. For the sake of convenience, Matsuya's plaintiff counsel discussed the damage of the atomic bombing under different categories: physical, mental, property and social damage. At the same time, the counsel pointed out the insufficiency of such analytical consideration of the effect of the bombing and emphasized the need of a comprehensive understanding. Mr. Mitsunori Kusumoto, who lived next door to Matsuya and suffered burns from the bombing while playing by the riverside, gave evidence of seeing his friends, who were with him, and a schoolgirl, who lived in the neighborhood of Matsuya, suffer from loss of hair after the bombing. Mr. Senji Yamaguchi testified about his hell-like experience in Nagasaki. He also showed data prepared by the Japan Confederation of A and H Bomb Suffers Organizations (Nihon Hidankyo) and demonstrated the existence of a number of cases of acute radiation injuries among long distance Hibakusha as well as the incidence of various symptoms called A-bomb disease among them. These testimonies by the Hibakusha refuted the Ministry's distorted view that `Matsuya's radiation dose estimated by the DS 86 is a mere 6.1 rad, and that cannot have any effect on human body'. The plaintiff's counsel elaborated on 5 points as to why the A-bomb Medical Law should be interpreted as having the nature of a state compensation law. One reason, which is central to this issue, is that the state is responsible for state compensation for A-bomb damage in the first place because the atomic bombs are peculiar in `leaving perpetual physical disability due to late effects of radiation unique to the atomic bomb, and for this reason the Hibakusha have been gravely afflicted with physical, mental, economical and social damages not comparable to those of war victims in general (Ishida case)'. The government is responsible for a state compensation also for a) initiating and waging the war which led to the atomic bombings, b) with the conclusion of the San Francisco Peace Treaty, relinquishing its right to claim damages which it could have otherwise claimed from the Unites States and c) having continued to neglect the Hibakusha in the post-war period, thus aggravating their suffering. Given that the government is responsible for state compensation for the Hibakusha for the above reasons, the counsel stressed that, to the greatest degree possible, the A-bomb Medical Law must be interpreted and put into practice for the benefit of the Hibakusha. It was from this viewpoint that the counsel argued that the burden of proof lay with the defendant, the Ministry of Health and Welfare. That is, unless the defendant could verify the existence of no relation between a Hibakusha's injuries or diseases and A-bomb radiation, they should be recognized as having been caused by radiation. Provided the burden of proof lay with the plaintiff, the counsel argued that a Hibakusha's injuries or diseases, which were the subject of the recognition, should be considered as having been caused by the radiation if they had been diagnosed as such and unless the diagnosis was medically unconvincing. The appeal shall be dismissed. The cost of the appeal shall be born by the Appellant. The case under examination concerns the claim of the Appellee, a victim of the atomic bomb used at Nagasaki, seeking withdrawal of a decision by the Appellant reached on September 24, 1987 that turned down the request of the Appellee having been submitted on the basis of Item 1, Article 8 of the Law Concerning Medical Care for the Victims of the Atomic Bombs (Law No. 41 in 1957, annulled in 1994 due to Law No.117, hereinafter referred to as "the Law") to have the hemiplegia and paralysis of the right side of her body and the external injury on her head certified as having been caused by the injuring effect of the A-bomb. Item 1, Article 7 of the Law provides that "the Minister of Health and Welfare confers an allowance on the Hibakusha (A-Bomb victims) who were injured or contracted an illness due to the damaging effect of the atomic bombs and that who actually need medical care. However, in case the injury or illness in question is not caused by the radioactivity of the atomic bomb, this allowance is applicable only when he or she actually needs medical treatment because of his or her healing ability being affected by the radioactivity of the atomic bombs." Item 1, Article 8 of the Law further provides that "those who seek to receive a medical allowance provided by Item 1 of the preceding article need to be certified in advance by the Minister of Health and Welfare that the injury or illness in question has been caused by the damaging effect of the atomic bombs." According to these provisions, in order to achieve this certification based on Item 1, Article 8 of the Law, it is understood that the Hibakusha need to be in a condition actually requiring medical care ("medical care requirement"). In addition to this requirement, the Hibakusha's current wound/illness, which actually requires medical care should be one caused by the A-bomb radiation, or, the above wound/illness should be caused by the damaging effect of the A-bomb other than the radiation but the Hibakusha's healing ability has been affected by the A-bomb radiation, causing him/her to remain in the above condition ("causability of radiation"). The original court ruled as follows: The above certification is made possible only when the applicant has proved that his/her injury or illness has been caused by the A-bomb radiation. However, in light of the severity of damage from the A-bombs, the special nature of the post-A-bomb diseases as well as the purpose and nature of the Law, the degree of proof on the causability of radiation should be interpreted as being sufficient if a "considerable degree of probability" is proved on the causality of applicant's injury or illness by the damaging effect of the A-bomb. Even if the degree of "high probability" is not proved from a physical and scientific point of view, the certification should be done by taking into consideration the situation at the time of the bombing, clinical history afterwards and the present condition of the Hibakusha. However, when the existence of a causal relationship is required for a certain administrative disposition, in a lawsuit seeking revocation of the rejection of the disposition, the degree of proof on the causal relationship to be given by the person whose application was rejected should not be different from that in any other civil suit, as long as there has been no specific condition set beforehand. And the proof of causal relationship in a suit should be to demonstrate a high degree of probability that can confirm the relation in which a specific fact has brought about a specific result, through a comprehensive examination of all the evidence in light of empirical rule, if not through natural science allowing absolutely no doubts. The disposition on the proof should be understood as requiring the certainty of the truth to the degree where ordinary persons do not raise any doubts about it. Therefore, with regard to the causability of radiation, one of the requirements for certification set in Item 1 of Article 8 of the Law, proving the "considerable degree of probability" on the facts requiring proof cannot be judged as being sufficient. And it is needless to say that, in proving the influence of the bomb radiation on the healing ability of a person who is in need of medical treatment to his/her injury or illness not caused by the radiation, the fact that the person is affected by the above "influence" with high degree of probability must be proved. It follows that, if the original court had made a contradictory decision from the above principle based on the purpose of existing laws regarding the degree of proof on the causal relationship, which should have been dealt with as an issue of the law on civil suits, it cannot but be considered as making a wrong interpretation of the Law and the Code of Civil Procedure. However, there are cases in which existing laws provide that the facts to be proven do not require strict existence of causal relationship. For example, Item 1 of Article 5 of the Law Concerning Special Measures for the A-Bomb Victims (Law No. 53 of 1968, hereinafter referred to as "Special Measures Law"; annulled by the enactment of the Law 117 of 1994), which was examined by the original court in the process of reaching the above ruling, provides as a requirement for eligibility of the health management allowance that disorder in hematopoietic function or others suffered by the Hibakusha "is not clearly established as not having been caused by the effects of the A-bomb radiation". So, this provision can be interpreted as having set as requirements "the inability of showing clear absence of causal relations" between the radiation and disorder in hematopoietic function or others, instead of proving the relationship. The above ruling of the original court may lead to the understanding that the requirement on the causality of radiation as provided for in Item 1 of Article 8 of the Law, which is an associated law of the Special Measures Law, should be interpreted in a similar manner. However, the Special Measures Law clearly sets separate requirements for the granting of each specific allowance. In contrast to the explicit provision in Item 1 of Article 5 of the law concerning the Health Management Allowance that requires only weak causal relationship as stated above, there should be no other interpretation for the provision in Article 2 of the law regarding the payment of the Special Medical Allowance than that the presence of ordinary causal relationship, not a weak one, is required. And, compared with these provisions in the Special Measures Law, Item 1 of Article 7 of the Law should be interpreted as setting the requirement of proving a general causal relationship between the radiation and a given injury, illness or healing ability. This should not change even if there lies consideration for the victims at the bottom of the Law or the Special Measures Law, which is similar to State compensation. Therefore, the above judgement of the original court should be regarded as a wrong interpretation of the law, even if it involves the requirements of substance. The original court judged that the Appellee is in an actual situation requiring medical care and that the situation has the causality of radiation, after making comprehensive examination of all evidence in this case, and ruled that the administrative disposition in question was illegal. So, as set below, this court discusses the judgement made by the original court, which affirmed the stated causality of radiation. At 11:02 on August 9, 1945, when the atomic bomb was dropped on Nagasaki, the Appellee (then 3 years and 5 months old) was on the verandah of her home, located 2.45 km from the center of the blast at 1-15 Inasa-machi, Nagasaki City (Present address: 415-2 Asahi-machi, Nagasaki City). A roofing tile blown by the bomb blast hit her directly in the left top of the head, and she suffered a serious injury of a depressed fracture and partial loss in the left parietal region of the skull. Due to the above injury, the Appellee temporarily fell into unconsciousness and the loss of motor function of her superior and inferior limbs, but was able to receive only an application of mercurochrome as treatment. For several days that followed, the Appellee stayed home showing the symptoms of diarrhea, and started to lose the hair on her head. On August 16, the Appellee was taken from home by her parents on foot, past a place 1.7 km from the blast center to Nagasaki Station. They took a train, which passed an area in close proximity to ground zero, to take refuge in Aino-cho, Minami-Takaki-gun, Nagasaki, and spent about 10 days there before going home. During her stay there, the Appellee was bed-ridden and did not have a chance to get any medical treatment, which made her wound in the head fester and produce pus. Around early October the same year, the Appellee evacuated with her parents to Tomie-cho, Matsuura-gun of Nagasaki. There, too, she was bed-ridden, and lost even more hair. The wound in her head did not close, heavily oozing pus or a watery secretion with strong stench of something rotting. With a diagnosis of a doctor that her wound could heal in a short while, she received treatment, but when part of the wound was about to close, another part started to ooze pus. Such a situation occurred repeatedly and the treatment was hardly effective. It was about 2 years and a half after the atomic bombing that the wound finally managed to close. Such a process of the Appellee's condition and the delay in healing was something that could not be explained fully only by the insufficient or improper treatment she received. During the treatment in this town, a small piece of a roof-tile was extracted from the wound in the Appellee's head. From December 31, 1945 to January 1, 1946, the Appellee was attacked by serious continuous fits of convulsions accompanying fainting, but was brought around by cardiac compression. The frequency of similar fits gradually declined, but she fell into unconsciousness once or twice a year during her school years, which continued until around 1967. Around 1959, she had a high fever of about 39 degrees Celsius, which continued for a week. At that time, her condition was not diagnosed clearly as an infection disease, and the cause was not found. The Appellee, both at the time of the administrative disposition and at present, has been diagnosed as having dextro-hemiplegia (brain atrophy) with head injury and has such disabilities as incomplete paralysis on the right side of her body and a flexion contracture of the right elbow joint. The left parietal region of her skull suffered a depressed fracture and some brain tissue was lost in the part of the fracture. This defect part is connected with the lateral ventricle, which is diagnosed as medullary porencephaly, and she has a variety of other indefinite complaints. It is difficult to fundamentally treat them, but for easing these conditions, drug therapy and physiotherapy are actually necessary. In general, in the case of head injury caused by a small object flying at high speed, the effect on the brain tissue is usually limited only to the injured area and does not cause much effect on the whole of the brain. However, the Appellee's injury was beyond such general explanation and extensive damage was inflicted on the parenchyma of the brain. Such an extensive medullary porencephaly is a rare condition and cannot be explained as just a complication of the head injury. This strongly suggests that there have been additional elements other than the blow by the roofing tile. According to the result of a survey conducted by a Japan-US joint investigation team in 1945 in Nagasaki, loss of hair was observed in 18% of the people within 1.5 km of the blast center and 10 % within 2 km. In Hiroshima, it was 19% within 1.5 km, and 7.5% within 2 km. In both cities, it is said that as the distance from the blast center got larger, the frequency of hair-loss grew less. Also, the survey conducted by the Ministry of Health in 1965 suggested that among those who were beyond 2 km radius of the blast center, there were significant number of people who had acute symptoms such as loss of hair, and even among the people who were outside a 4 km radius, 11% of those having entered the city in an early period, and 3.1% of others showed the loss of hair. Further, according to a Ministry of Health survey of 1985, among the deaths caused within 2 or 3 km radius of the blast center, 3.2% in Nagasaki and 5.4% in Hiroshima were from acute diseases. Also, Chieko Watanabe, hit by the A-bomb at 2.9 km from the Nagasaki blast center , which was in the same direction of the area where the Appellee was located, had her spine fractured under a steel beam of a collapsed factory. She developed high fever immediately after the bombing, and after some time, it was followed by loss of hair. She did not have menstruation for a year after the bombing. The wound did not heal easily, which festered and let off a stench. As of June 29, 1959, she received recognition that Item 1 of Article 8 of the Law was applicable to her. Mitsunori Kusumoto, who was at 2.4 km from the ground zero of Nagasaki, experienced some loss of hair about one month after the A-bombing, but a friend of his who was with him at the time of the bombing lost all his hair. Masako Kajiwara, who was 2.5 km away from the center of the blast of Nagasaki City, developed a fever right after the bombing. Loss of hair was observed about one month later, and after two months, she suffered from nose bleeding, vomiting and diarrhea. There are stochastic effects and deterministic effects among the effects of radiation exposure on human body, and only the induction of cancer and genetic effects belong to the former, while all others belong to the latter. Therefore, the point in question in this case should be the deterministic effects. However, it is argued that there is a threshold dose of radiation exposure for deterministic effects, under which effects of radiation should not occur. It is said that the threshold for each symptom is 1000 rad for damage on cerebral nerve cells; 100 rad for leukopenia; 300 to 500 rad for epilation; a little over 10 rad for lowering of immunocompetence due to damaged lymphatic corpuscles and so forth. DS86, a dosimetry system for radiation from the atomic bombing, was adopted in March 1986 by a Japan-US joint committee set up to reevaluate the A-bomb radiation dose, and has been treated around the world as a superior systematic dosimetry system. According to DS86, a total radiation dose of gamma rays and neutrons in the air in Nagasaki was 2.963 rad at 2.4 km from the blast center, and 2.092 rad at 2.5 km, and the dose from residual radiation was insignificant. It is said that the assessed value of uncertainty on the above dose was 13% in the air, and organ dose was 25-35%. Indeed, a mechanical application of the above threshold theory and DS86 would lead to the conclusion that the present condition of the Appellee was not due to the effects of radiation, and it is difficult to deny that a significant doubt would be raised in leading to the recognition that there was a causality from radiation in this case. However, the fact that DS86 produces assessed values still containing undetermined parts and a review on this dosimetry system is going on at present was lawfully confirmed by the original judgment. And by mechanically applying DS86 and the threshold theory, it seems that the facts as stated in (7) of 1 of III cannot necessarily be explained fully. For example, regarding epilation, a typical acute symptom caused by radiation, the court cannot but hesitate to judge that most cases of epilation, having occurred in the areas where, as long as DS86 and the threshold theory were applied mechanically epilation could not have happened, were caused by factors other than the bomb radiation, such as malnutrition or psychogenic reasons. While taking this into consideration, if the case is examined based on the facts stated in 1 of III, especially the extensive damage inflicted on the brain of the Appellee inexplicable by the physical impact only, and the loss of hair appearing on her, the following conclusion can be drawn: The brain damage of the Appellee was inflicted by the hit of a roofing tile blown by the blast of the atomic bomb as a direct cause, but it became serious because she was exposed to a significant level of the A-bomb radiation, or because her healing ability was lowered by the radiation. As a result, she has been in the present condition requiring medical treatment, i.e., her condition can be judged as having causability from radiation, and it is not possible to conclude that this judgment cannot be accepted based on empirical rules. If such is the case, the original judgment of this case, which confirmed the radiation causability, is not something that cannot be upheld, and thus the stated violation of the Law (*Code of the Civil Procedure) by the original court regarding the degree of proof in court cannot be definitively considered as something that would influence the conclusion of the ruling. Therefore, after all, the claim (*of the Appellant) cannot be accepted. Thus, this court renders decision as set forth in the main text, with the unanimous opinion of all of the justices. It is a great pleasure to be able to report to you, who have came from across Japan and the world, of the victory of the Nagasaki A-bomb Matsuya case in the Supreme Court. Please look. This is the official certificate that recognizes my disease as caused by the atomic bombing. I want to thank all of you with all my heart for your longtime support. My dream of the final victory has finally come true. I have no words other than to say "happy" to explain my present feeling. This victory is not only mine, but also the victory of all the Hibakusha and people who aspire to achieve the abolition of nuclear weapons. Twelve years had passed since I filed the lawsuit against the government in 1988. I never imagined the ordeal would be so long. As the case went through the Nagasaki District Court and the Fukuoka High Court, it gathered more and more support from people across the country. While the case was being heard at the High Court, petitions supporting my case had reached 530,000. Such a number of petitions was unprecedented in the history of the Court and had a great influence on the ruling, which ended up in favor of my case. However, the government was persistent in refusing to recognize my illness as A-bomb disease and appealed the case to the Supreme Court. How cruel they can be! I was exasperated by their attitude. I was agonized by the unforeseen struggle before me, but I always knew that there are people like you out there across the country who support my case to inspire and encourage me. Yesterday, this certificate was issued. But I have received no word of apology from the Ministry of Health and Welfare. The Ministry owes a load of responsibility for taking a long 23 years to have this issued. Now our next work is to hold the Ministry responsible to make the best use of this judicial decision for the Hibakusha administration. Until then our struggle is not over. Now 3 similar Hibakusha cases are pending in court. All three Hibakusha are forcing themselves in pursuit of the state recognition despite their illness. I am determined to exert my utmost effort for their earliest victory. I want to ask you to give your support to each of the Hibakusha. On August of 55 years ago nuclear weapons were dropped on Hiroshima and Nagasaki. Today we stand at the dawn of the 21st century. I, as a Hibakusha, am determined to do my best, however small it may be, to achieve the abolition of nuclear weapons. I am General Secretary of the Plaintiff Counsel of Matsuya Lawsuit. First, I want to thank all of you for your support to the Nagasaki A-bomb Matsuya Lawsuit, which greatly contributed to the final victory of the case. On July 18 this year, the Supreme Court ruled to reject a final appeal of the Minister of Health and Welfare against lower courts' decisions that ordered the Ministry to provide special medical coverage to Ms. Hideko Matsuya for her illness caused by the atomic bombing of Nagasaki. Based on the ruling, the Ministry finally approved Matsuya's illness was related to the bombing. It took 12 years since she first filed suit with a district court against the Ministry for its refusal to recognize her claim. This victory was made possible when Matsuya's struggle with an indomitable spirit was joined with forces of the Plaintiff Counsel of 150 lawyers, a networking support activities of 10,000 people, a petition campaign, which succeeded in collecting more than 1 million signatures and backups of a number of scientists. I want to convey our wholehearted gratitude for your tireless and affectionate support. In filing the lawsuit, we had identified significance that the lawsuit would have, if resulted in favor of our case, in government's recognition criteria, according to which state-covered medical care is provided to the Hibakusha. Firstly, the lawsuit could work for removing a condition of distance from the Ministry criteria. Under the present criteria, to qualify for medical support as having A-bomb symptoms, a person must have been within 2-km-radius of the hypocenter. Matsuya was at 2.45 km from the hypocenter at the time of the bombing. The Ministry's "within 2-km-criteria" is based on a system called the DS 86 (Dosimetry System of 1986). The DS 86, established mostly by American scientists, is a computation system used in nuclear weapons development for estimating amounts of radiation generated by a nuclear explosion. This computation system is used to derive an amount of radiation at a certain distance from the hypocenter of Hiroshima and Nagasaki. The Supreme Court confirmed that mechanical application of the DS 86 is a fault. We think that the court ruling will effectively widen the door for state-covered medical care given to the Hibakusha, who do not fall in the category of "2-km-range." Secondly, we wanted to remove a condition on the types of diseases and disorders from the ministry criteria. Hitherto, to qualify for the Sate-covered medical care, a Hibakusha has to have an illness, such as cancer or leukemia, which has a clear link with radiation in view of medical science. In Matsuya's case, her motor function disorder was caused by damage to the brain. Since the ruling recognized Matsuya's symptom as linked with radiation exposure, we believe that many more Hibakusha in similar situation as Matsuya will be able to receive the state medical care. We had also identified two goals to achieve through the lawsuit. One is to hold the government responsible for state compensation for the Hibakusha, and accordingly have it thoroughly examine and revise its Hibakusha administration. We have won the case. But, if we stopped our march here, the government's Hibakusha administration will stay the same. The ruling of the top court is a first tool we have achieved through our struggle. With this, our campaign needs to be further developed. To hold the government responsible for state compensation is to have it support and work towards the abolition of nuclear weapons. This lawsuit has been a struggle for the abolition of nuclear weapons. That is why the case won support of such a great number of people and the victory. Let us remind ourselves that our struggle continues until the day the world is finally set free of nuclear weapons. Sep. 26: Hideko Matsuya filed a lawsuit with the Nagasaki District Court against the Ministry of Health and Welfare for retraction of its decision dismissing her application for official recognition of her as an A-bomb disease patient. Dec. 10: The Association of Supporters for the Nagasaki A-bomb Matsuya Lawsuit was formed. Dec. 16: First oral proceeding: Plaintiff Hideko Matsuya made a statement; the defendant, the Minister of Health and Welfare, insisted that the ruling should be transferred to the Tokyo District Court. Oct. 26: The 5th oral proceeding: the defendant withdrew the statement seeking the transfer of the case and it was decided the suit could be handled at the Nagasaki District Court. Apr. 20: The 7th oral proceeding: the Matsuya side argued that the principle of interpretation of the present law should be that in case there is doubt, it should be to the advantage of the Hibakusha. Jan. 9: Shima Matsuya, Hideko's mother, died at age 85. Jul. 3: The 12th oral proceeding: From the plaintiff's side, Ikuro Anzai, professor of Ritsumeikan University, testified that the A-bomb damage could not be explained only by ionized radiation. Sep. 26: The 13th oral proceeding: From the plaintiff's side, Anzai testified that damage beyond the explanation of the present science should not be ignored. Apr. 3: The 16th oral proceeding: Shuntaro Hida, director of the Central Counseling Office of Nihon Hidankyo, entered the witness box for the plaintiff and refuted with evidence the position of the state that there was no effect of radiation at more than 2 km from the A-bomb explosion center. Jun. 4: The 17th oral proceeding: From the plaintiff's side, Kanehiko Yamashita, Hideko's doctor, testified that the relationship between the plaintiff's injuries and effects of radiation could not be denied. Dec. 18: Clinical examination of Chieko Watanabe, A-bomb survivor and witness for the Matsuya side, was conducted. Jan. 13: The 21st oral proceeding: Questioning of Mitsunori Kusumoto and Senji Yamaguchi, A-bomb survivors and witnesses for the plaintiff's side. Feb. 9: The 22nd oral proceeding: Questioning of Matsuya; presentation of the closing statement of the Matsuya side; the trial was concluded. Mar. 13: Chieko Watanabe died at age 64. May 26: A ruling in favor of Hideko Matsuya was handed down by the Nagasaki District Court. Jun. 7: The Ministry of Health and Welfare appealed to the Fukuoka High Court. Oct. 14: The first oral proceeding: the State side presented a written statement of reasons for appeal and the Matsuya's side made a statement. Jan. 21: The 2nd oral proceeding: the Matsuya side refuted the State's statement of reasons for appeal; the Fukuoka Center of the Supporters' Association was formed. Apr. 15: The 3rd oral proceeding: The Matsuya side again refuted the State's statement of reasons for appeal. Jun. 23: The 7th oral proceeding: From the plaintiff side, Kanehiko Yamashita, Hideko's doctor, again testified that the relationship between the plaintiff's injuries and effects of radiation could not be denied. Oct. 13: The 8th oral proceeding: From the plaintiff side, Masaharu Hamatani, professor of Hitotsubashi University, refuted the logic of the State with data from a survey of Hibakusha, testifying that acute symptoms of radiation appeared among those who were exposed to the A-bombing at more than 2 km from the epicenter. Apr. 19: The 10th oral proceeding: the State side submitted its closing preparatory statement. Jun. 27: The Matsuya side made its closing statement; the trial of the Fukuoka High Court was concluded. Nov. 7: The Fukuoka High Court rendered a ruling that was a victory for Matsuya, the plaintiff. Nov. 20: The Ministry of Health and Welfare appealed to the Supreme Court. Jan. 14: The state side presented a written statement of reasons for its appeal. May 1: A signature campaign for requesting the Supreme Court to turn down the appeal was begun. May 14: The Nagasaki A-bomb Matsuya Lawsuit Network (national organization) was formed. Dec. 11: A Kyoto lawsuit for recognition as an A-bomb disease patient resulted in a victorious ruling; the Ministry of Health and Welfare appealed to the Osaka High Court. May 6: Matsuya's counsel submitted a written statement to refute the State's written statement of reasons for appeal. May 11: Matsuya made a speech at the "Global Hibakusha" session of the Hague Appeal Conference for Peace held in the Netherlands. Jun. 29: Kazuo Azuma, A-bomb survivor, filed a lawsuit with the Tokyo District Court for official recognition as an A-bomb disease patient. Oct. 1: Koichi Yasui, A-bomb survivor, filed a lawsuit with the Sapporo District Court for official recognition as an A-bomb disease patient. Mar. 22: The 10th round of petition actions to the Supreme Court was carried out; the signatures so far presented exceeded 500,000. Jul. 18: The Supreme Court handed down a ruling completely in favor of Matsuya. Jul. 31: The Ministry of Health and Welfare recognized Matsuya as having A-bomb diseases.